I’m using prices from Bitstamp — this is purely because of a combination of fairly good volumes and a good trading engine. Most of my analysis can be replicated on another exchange just as easily. My long-term outlook is currently bearish — we are still seeing lower highs and lower lows since our all time high at the end of November. A turnaround is unlikely in the next few days — there are no early signs of one yet. We began the week with a choppy recovery from a huge correction, which had taken us down to the $550 level. A slightly ascending triangle; common at minor bottoms; gave us the upward trend which lasted until Wednesday, and took us to the $990 price level. The markets couldn’t sustain beyond this level: $1,000 has come to be a very important resistance level. Prices were pushed back to the $840 — $870 levels. $840 is a very important support level — the price stopped reducing here in between the earlier double peaks. We settled into a bearish descending triangle with our solid support at $840, but failed to break it, instead breaking out upwards. Low volumes suggested this was a false breakout, and indeed prices started trending down again. This suggests we are still very much in the bearish part of the price cycle. In the next week, I expect steadily lower lows, going down to $760, which is our next support level. 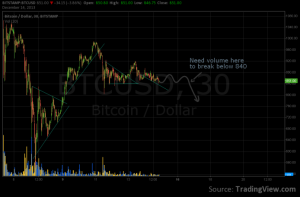 The support level of $840 is going to be almost certainly broken, given the bearish activity on BTC China today. I choose not to speculate with wild charts showing future predictions, these tend to be misused very quickly. I only use the charts to validate my previous comments. Stay up to date on Bitcoin with the past week’s overview.